Apples should be handled with the same care as you would eggs as they can bruise very easily. Look for firm apples that are well shaped and have smooth skin that is free of wrinkles and bruises. Brownish freckled areas do not affect flavour. To keep the crunch in Ontario apples, store them in perforated plastic bags in your refrigerator crisper. Cold, humid storage ensures that apples maintain their crispness, juicy texture and full flavour. 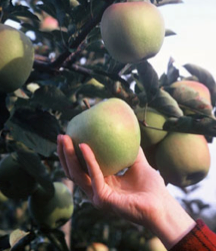 Remove any fruit that are overripe or have soft spots because they naturally give off ethylene gas that will cause nearby apples to ripen too quickly and spoil. Trim and use these apples for pies or applesauce. The ethylene gas emitted by apples can also speed up ripening in most produce so store apples separately from other fruits and vegetables. To prevent browning when preparing apples, sprinkle cut surfaces with lemon juice.